Rust-Oleum CombiColor is the UK's leading direct to metal paint, which can be applied directly to rust and aged metal, offering longer-lasting protection on both interior and exterior surfaces. 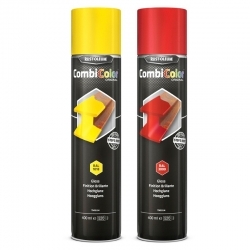 CombiColor will remain flexible under most conditions, without cracking or flaking when bent. Its sag resistant properties mean that you can apply any one of the hundreds of CombiColor colours without worrying about brush strokes and streaks. So, when you need a reliable, durable, low-odour, one-coat maintenance system for metal, look no further than Rust-Oleum CombiColor, available in matt, satin and gloss, in the widest colour selection available online, at Rawlins Paints. A hammered finish maintenance paint for metal with superior metal protection, even direct to rust. Rust-Oleum CombiColor Hammertone is a primer and topcoat in one, ideal for various little projects. 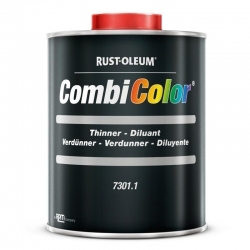 For a satin, matt or gloss finish, please check out Rust-Oleum CombiColor paint. CombiColor metal paint prices will vary dependent on finish, container size and colour, with all variants available for next day delivery across the UK. For cost-effective solutions, the full CombiColor range offers an unbeatable selection of options to meet your needs, including direct to metal standard gloss, satin and matt finishes, along with CombiColor Multi-Surface paint, specialist Hammertone and Wrought Iron finishes, and Rust-Oleum's CombiColor Aerosol range. Previously these products were located within different categories on Rawlins Paints, but now we have compiled them into their own category so that you can pick your combination with ease on mobile devices! CombiColor metal paint can transform aged, worn and rusted surfaces in minutes, offering a durable coating that is weatherproofing and can be applied in temperatures as low as 5°C. 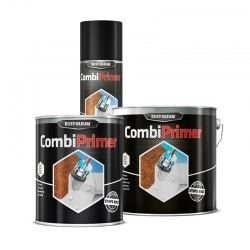 CombiColor can also be used on wood, acting as a primer and topcoat in one. 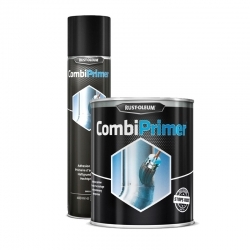 It is recommended that CombiColor metal paint is applied on bare and manually de-rusted metal surfaces, or with the prior application of CombiPrimer Anti-Corrosion 3369/3380. Drying times 20°C/50% r.h. 10°C/60% r.h. 30°C/50% r.h.
Heat resistance: 90°C (dry heat), at elevated temperatures discoloration may occur. Prior to application, remove any dirt, grease, oil and other surface contamination with a cleaner/degreaser. Manually remove loose rust and deteriorated paint by scraping and wire brushing. Finally, sand existing glossy paint to ensure good adhesion. The surface should be clean and dry before application of the coating.